Your Vacation In The Mountains! Welcome to Pigeon Forge Attractions! The Smoky Mountains are one of our favorite family friendly vacation destinations for kids and adults of all ages. This is not just a summer vacation spot anymore! Over the past several years, the area has exploded into an indoor and outdoor resort area with interesting and exciting activities 365 days a year. The area now hosts over 11 million visitors annually and is the 6th most visited destination in the country. And right next door, the Great Smoky Mountains National Park is the #1 most visited National Park in the country. Leave the planning on the fly to the tourists. Explore our Pigeon Forge Attractions information so you can enjoy every single relaxing moment. But first, let us introduce ourselves. We are people just like you who love to travel and wish to share our ongoing family vacation experiences without all the hype. Whether you prefer the natural scenic beauty of the Great Smoky Mountains or the endless exciting area attractions, we invite you to join us for a vacation that will create memories your family will cherish forever. Should you need information to plan your trip, or to find the best deals on area entertainment or lodging we have often found Reserve Pigeon Forge to be an excellent resource. It‘s All About the Smokies! Pigeon Forge is one of the key access points to the Great Smoky Mountains National Park which is the most visited national park in the country. Its name refers to the blue misty haze that surrounds them and is a picturesque setting for most Pigeon Forge attractions. The park is open all year round and is free to the public for all to enter as a wilderness preserve that covers an area of over 500 thousand acres. It’s located over mountainous terrain with majestic stands of forest, diverse wildlife, streams, river and waterfalls that provides for hundreds of miles of trails for hiking and exploration. Did You Say Theme Parks? So...where do we start? Let’s start where children at heart want to go most! Pigeon Forge attractions has adventure parks for every size, every speed and everyone. No matter your choice there is fun in your future. Is the major attraction in the area. See and read more in the Pigeon Forge attractions area by clicking on Dollywood Theme Park. Or Did You Say Amusement Park? One of the most popular Pigeon Forge attractions at Adventure Raceway is the elevated three level go-cart track. You actually get a pretty good ride at a reasonable price. The attraction also has an arcade, a mini-golf course and you can cool down by splashing your friends on the water bumper boats. It was a fun experience and we will most likely do it again. 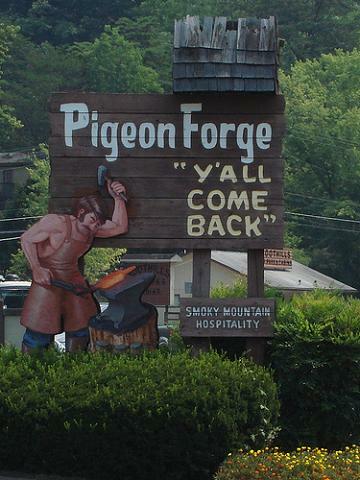 Just might have what you are looking for in Pigeon Forge attractions. I would call it a mini amusement park with fun for all ages. They have a variety of activities for children including an arcade, kiddie rides, bumper boats and two 18 hole miniature golf courses that wind through a shipwreck, waterfalls and castles. For the older children they have skid racers, bungee jumping an ejection seat and a skyscraper skydiving ride. The biggest attraction is the multiple go-kart tracks including the pro track, elevated track and figure 8 track with CAN-AM racing. In all, we had a very good time in just a couple of hours. Is definitely a family friendly Pigeon Forge attractions arcade with the flavor of the 50s and 60s. We really liked the large variety of games that are available for all the kids. We had a lot of fun and collected hundreds of tickets from the redemption games. They had a huge redemption area filled with gifts and prizes to choose from. They have a lot of games to choose from including video, shooting, driving, dancing, punching, basketball, baseball, soccer, coin pushers, cranes, skeeball, air hockey, car racers, and pool tables. Make sure to ask about what they have for specials before you start playing. Rockin Raceway also give you a good go-cart ride on a fast-paced, slick pro-track. Is another Pigeon Forge attractions family fun park with the entire family in mind. It is a fairly large park with a few more thrill rides than most other fun parks. They have a pretty fast go-cart track and a great junior track for the younger kids. The thrill rides include skyscraper, ejection seat, and bungee tower. We did ride the skyscraper which loops around at speeds of over 60 m.p.h. and gets you up over 150 feet off the ground. They also have featured a bungee trampoline, human gyro and a bull ride, which was a lot of fun to watch. They do have specials so be sure to ask before you start to ride. We visited the Speed Zone Fun Park again last year and had a great time. Speed Zone has four custom built racetracks including a three story wood track. The two twister tracks intertwine and take you around several corners and curves on three different levels then bring you back to the top. If you have any young racers, you can let them feel like they own the world by driving themselves on the oval kiddie track. I just love the feeling of the speed and as it always makes me feel like a kid again. If you like to ride, and you can plan to stay here for a while, the best deal is to purchase the armband so you can ride all day at Pigeon Forge attractions. Is a fully enclosed indoor family entertainment center. No matter the weather outside you can enjoy the arcade or go cart track area as they are covered rain or shine. They offer over 10,000 square feet of arcade games that you have an option to play all day. You can purchase an armband that gives unlimited access to games as well as the air hockey and pool tables. Star Tracks Pigeon Forge attractions also offers one of the finest multi level laser tag arenas in the area and a fast pro race go cart track where speeds up to 40 mph are not unusual. Overall, this is a great stop to just enjoy being a kid again. Take the plunge with a mountain water park adventure with cool and exciting fun activities for the entire family. Whether it is winter or summer, Pigeon Forge attractions has water parks for every season! Is the major outdoor water park in the entire area. See and read more in the Pigeon Forge attractions area by clicking on Splash Country. Is the one of the most popular indoor-outdoor water park resort in the entire area. See and read more in the Pigeon Forge attractions area by clicking on Wilderness at the Smokies. The Smoky Mountain area is home to many entertaining and award winning live shows including several dinner theaters. Shows feature all venues of music that include country, bluegrass, gospel, broadway, rock and more. From music and dancing to laughs and magic, the areas theaters present all styles of entertainment. Is the one of the most attended live shows in the area. See and read more in the Pigeon Forge attractions area by clicking on Dixie Stampede. Are a huge favorite and tradition for Pigeon Forge attractions. To see and read more about live shows click on Live Shows. There are several Pigeon Forge attractions that feature a more hands on adventure. It might be landing a space shuttle, or jumping out of a plane, playing laser tag or whitewater rafting. Whatever your preference, there are plenty of options in the area to choose from. Is the one of the most attended interactive attractions in the area. See and read more in the Pigeon Forge attractions area by clicking on WonderWorks. Sure…you can go to the typical Pigeon Forge attractions water parks but there is no comparing a real river and a real raft to give you a real live thrill. If you haven’t tried river rafting, I would really suggest you take the opportunity. Once you do, it may not be your last. You just can’t duplicate this experience at a waterpark. The Pigeon River has over five miles of class III rapids. The upper portion offers the best ride as it actually carves a gorge through the mountains in this rafting area. The lower portion of the river has more of a lazy rapids, but give you more time to enjoy the whole outdoor experience with some great views of the Smokies. You also have additional choices to ride the river from a canoe, funyak, tube, or the full whitewater rafting adventure. You can spend the better portion of the day here with plenty of activities to choose from. Just being here for a picnic and listening to the river is worth the trip. If you want to do more than picnic, you can take the adventure rafting trip, the slow ride through mild rapids, float down the river, test your strength at the challenging climbing wall or play volleyball or horseshoes. We had a great day here! Is a great choice for movie fans. The whole family can have fun taking photos with the wax models of Hollywood stars, checking out the Chamber of Horrors, and the Wizard of Oz, as well as plenty of other options. To see and read more about it just click on Hollywood Wax Museum. Pigeon Forge attractions offers several world class golf courses in beautiful country settings. The back drop of the Smoky Mountains offers a beautiful landscape for some of the best golfing in the country. Rolling hills and valleys set you up for challenging courses in a magnificent setting that invites you to enjoy a round of golf to remember. To see and read more in depth information about golfing in the Pigeon Forge area click on Pigeon Forge Golf.